"When I am Laid in Earth (Dido's Lament)" released on March 17th, 2015 and is viewable below and on Youtube. In an experimental arrangement and art-video, Roxanna Walitzki explores the transitory nature of being, questions what remains when we cease to exist, and reinvents the past by breathing imaginative new life into "When I am Laid in Earth (Dido's Lament),” from Henry Purcell’s 17th-century opera Dido and Aeneas. Marking the beginning of an innovative new period, she seamlessly blends traditional opera with her unique brand of styling, movement, and audio production. Roxanna uses electronically-manipulated organic sounds to augment the score: desperately gasping breaths, scraping bones, and samples of luna moths (in various stages of their short and restless lives), punctuate the song’s drama, with simultaneous force and sensitivity. The accompanying art-video, directed by Anthon Smith and with cinematography by Brendan Flynn, likewise examines the ephemeral essence of life. 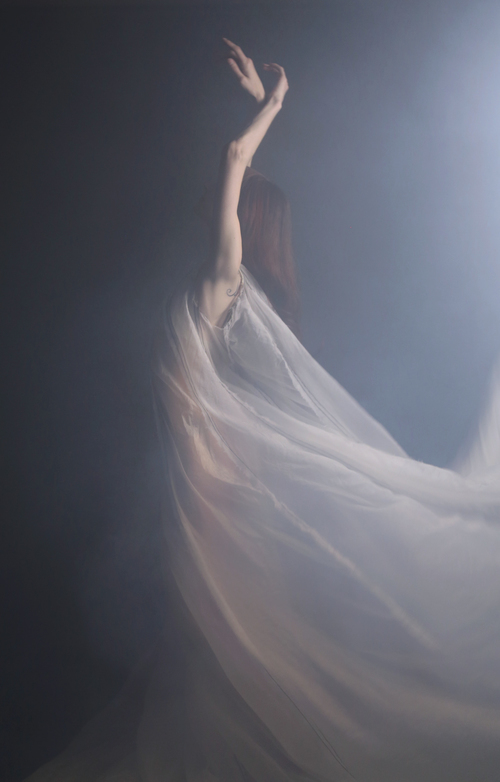 Expressive dance-like movements, based loosely on the haunting gestures in Pina Bausch's Cafe Müller, echo the singer’s dreamlike final moments. Roxanna’s intricately hand-beaded and -sewn fashions assert their details in the blinding light, while an ethereal gown, fashioned from parachute material by Stone Crow Designs, sweeps skyward. Dido surrenders to inevitable death, but her plea for remembrance is suspended in time. Learn more about Roxanna Walitzki. The images below were created as exclusive content to accompany this video. They feature Roxanna's styling and fashion, as well as gowns by Stone Crow Designs. Photography by Anthon Smith. High-resolution images available on request.